If you play with HF antennas you are certain to be winding coils, perhaps more than you'd like. They are used to shorten antennas, make traps, as components of impedance matching networks, filters, coax common mode chokes and as a helix can be the antenna itself. Although deceptively simple devices they can be the source of much angst. Coil diameter: What is the true diameter of a coil? Insulation: Is there an effect? Wire length: How much wire does it take to wind a coil? Of course the trivial answer is that the wire should be long enough to reach from one end to the other! Often you will want a better answer than that when you must cut the wire before winding the coil. Efficiency: Diameter, length, gauge, metal, pitch, form and core all have their effects. Lots of good stuff has been written about this so I will direct you there. Excellent resources are W8JI on coil Q, N6LF on effect of wire insulation and K9YC on ferrite cores. Rather than deal with the more technical aspects of coils -- which as noted are ably dealt with by others -- in this article I'll address a few geometric parameters that while seemingly trivial are important for building coils. Reviewing elementary knowledge can be helpful. What is the diameter of a coil? A common answer is that it is the outer diameter of the coil form. This is only approximately true. As the ratio of wire diameter to the form diameter approaches zero -- thin wire, large form -- it is effectively true. However it is not true when the coil's application is high power or high Q since the wire diameter can be a large fraction of the form diameter. 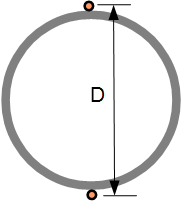 The diameter to use in coil inductance equations is wire centre to wire centre. The diagram at right illustrates the problem. The form is shown as a solid tube and the wire is shown with insulation, although there may be none. I frequently use insulated wire in my antenna projects for its convenience and to remove the risk of shorted turns in my hand wound coils. Let's assume the coil form is 2" (5 cm) since that is one I use in some of my projects. AWG 12 wire has a diameter of 0.064" (1.63 mm), which gives a wire to form ratio of 0.032, or 3.2%. This can be quite significant. If the wire is insulated the ratio increases to ~5% (depending on the insulation rating) because the insulation separates the form and wire. For bare copper the coil diameter is 2.13" and for insulated wire the diameter is ~2.2". If this appears surprising notice that we use twice the wire radius, which is its diameter, and twice the insulation thickness, which is one side of the insulation on each wire. An easy way to do this is to measure the full wire width with calipers and add that value to the form diameter. Consider a coil built in this fashion that has an inductance of 3 μH for a coil diameter of 2". When you account for the wire gauge and insulation (AWG 12) the true diameter is ~2.1" and the inductance grows to 3.6 μH. That's a big difference! A small difference cause a large inductance change because the inductance of a coil increases with the square of its diameter, for a fixed coil length and turns. By calculating coil inductance with the correct diameter you won't be for an ugly surprise when you install it in a matching network, and there adjustments will be fewer and finer. For an example look at my article on the 160 meter vertical matching network I built which required no adjustment at all. Accurately measuring coil inductance can be difficult so it's nice to know we can get the inductance right by understanding the impact of coil geometry. Often you'll need to cut the wire before winding a coil. That's when you especially want to accurately calculate the length of wire required. Cut it too short and you run into grief, and waste; cut it too long and some wire is wasted. Copper isn't cheap! I just ordered more radial wire and the price has increased 10% over the past 6 months. I covered coil diameter first since you need to get that right if you're to correctly calculate the amount of wire in a coil. A naive length calculation of the wire length for a single coil term in the previous example (2" coil form) is 2π = 6.28". However since the true diameter is closer to 2.1" a better estimate of the wire length is 6.59", which is 5% higher. The wire length is proportional to the diameter. This is significant since for a 10 turn coil on a 2" form you would end up 3.1" short using the naive calculation (65.9" vs. 62.8"). Of course you should not forget to add to the total the length of the coil tails at both ends. I tend to underestimate the tails so you may want to be careful with that. A coil turn is a spiral rather than a circle. It should be evident that the length of wire in a spiral is more than in a circle due to the linear displacement of the start and end points. The linear displacement due to the coil's pitch increases the length of wire required for a given coil diameter, pitch and turns count. That is: L > TπD. But how large is the difference? We can deal with spirals using elementary topology. Notice that a cylinder, like a steel pipe, is a rectangle folded into a circle. Unfolding one turn's worth of the cylinder help to visualize the problem and to accurately determine the length of wire in a one turn spiral. The spiral turn of wire around the cylinder becomes a diagonal line between opposite corners of a rectangle. The rectangle's height is the the turns pitch; if there are 8 turns per inch the pitch is 0.125". The rectangle's width is the circumference of the coil. Pythagoras comes to the rescue by noting that the diagonal is the hypotenuse of a triangle. The wire length is the square root of the sum of the squares of the pitch and diameter. Therefore the wire length of for a 10 turn coil is L = T × sqrt(P² + (πD)²). Using a pitch of 0.25" (4 tpi) and a coil diameter of 1.1" (1" form plus wire) the length of wire is 34.7". Even for this rather large pitch the spiral's length is only 0.3% (0.1") more than the 34.6" for a naive calculation assuming the a coil turn is a closed circle. The naive calculation is perfectly adequate except for coils with an exceptionally large pitch and narrow form. The only time you are likely to encounter this is in a helical antenna. Although not really a coil (inductor) the geometry is the same. When you coil a wire you are often pushing the metal beyond its yield strength to get a non-elastic deformation. That is, the wire doesn't snap back into its pre-coiling shape. Deformation can occur throughout the wire diameter, being stretched into a greater length on the outside and compressed to a shorter length on the inside of the coil. However the former is more likely. This is not a simple problem to solve, so it is lucky the that the effect is small enough in almost every case that it can be ignored. Since we improved the diameter calculation to use the centre of the conductor and the centre is approximately equidistant from the surfaces where deformation is likely to be greatest we should see little difference in the length requirement. Were the wire centre to stretch we would in fact need a tiny amount less wire to wind the coil. Insulation adds elasticity to the wire. Bend straight lengths of identical insulated and bare wire and you'll see that the insulated wire rebounds more. The copper is still yielding on the inside but when the force is remove the elasticity of the plastic covering reverses some of that. Since it's the diameter of the conductor that concerns us we can ignore the behaviour of the insulation. It would take an extreme bend radius of a heavy gauge wire for the plastic to ripple on the inside thus increasing its effective thickness. Toroidal and other non-cylindrical forms add another factor for consideration. If the wire is of large enough gauge the coil will tend to follow a circular form rather than seat on the toroid's quasi-square surface. In that case with regard to wire length the diagonal cross-section distance is a good approximation to the coil's diameter, plus of course the wire itself as we saw earlier. Smaller wire than conforms to the toroid surface can treat the coil form as a square (or rectangle), and therefore those dimension should be used as the basis for determining the length of wire required. Getting the length right is generally more important for a toroidal coil since in almost every case the wire must be cut beforehand and wound onto a holder that can be threaded through the centre of the toroid. This is where you really don't want to underestimate the length of wire required. There are several coil and wire geometric parameters than affect inductance and wire length. While some of them are quite interesting there is only one that is significant in nearly every real coil: effective diameter. As we saw, using the coil form diameter for the coil diameter can lead to significant error in the calculated inductance and required wire length. Well, so much for this little diversion. With less bad luck than I've suffered recently I should soon be back to talking about antennas.